Going through the process of removing mold from your home can be a nightmare. Mold hides in dark places, and slowly works on destroying a property. Often, Mold goes undetected, making it a serious problem. Mold, a fungus, can be found in bathrooms, beneath tiles and floorboards. Mold can also be found near appliances like washing machines or dishwashers, underneath sinks and near water heaters. Whether it’s visible mold, the smell of mold, or a hunch that the mold may be there, here are a few reasons why a pro should handle it. First of all, consider that mold grows incredibly fast. 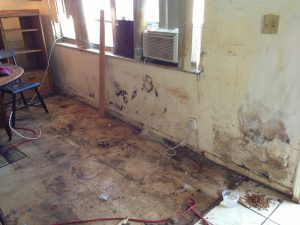 Even the most minuscule patches of mold can be a huge problem. If it’s a dark, damp area, it has a high likely hood of experiencing mold growth, and the spreading of that mold. Once it grows, it’s only a matter of time before it starts damaging the structural integrity of a home, and the well being of belongings as well. When it comes to mold, the earlier the call for assistance is made, the smoother the removal process will go. Furthermore, consider that mold makes allergy symptoms worse. If you’re experiencing allergic symptoms, you may think that it’s just the return of your seasonal allergies. But, things like irritated eyes, a runny nose, fatigue, or a sore throat can be caused by mold. It’s a good idea to make sure that you don’t have mold in your home, as it could be the cause of those allergic symptoms. As we explored in the last point, once mold grows, it quickly spreads. The spores that mold can release easily float around your home and make your allergic symptoms worse. If you believe mold to be the cause of your allergic symptoms, you can restore peace of mind by calling a professional. Additionally, while not all molds are toxic, most strains of mold can cause serious health problems. When mold spores are inhaled, they can create lung infections and other serious medical issues. If the mold isn’t removed entirely, these health risks will remain. So, if you want to make sure your family is safe, hire a professional mold removal company. Also, professional mold removal companies will know how to detect all types of mold. Never try to do it yourself when it comes to mold removal. Professionals will be able to detect all mold, no matter what stage of growth it’s in. After they’ve found it, the professionals will use proven techniques to kill the mold and prevent it from growing back. There are plenty of home remedies that can be found online to try and remove mold yourself. When it comes to mold, this isn’t something you want to take a chance on. It’s hard to kill mold entirely. A professional company will come to your home with the proper equipment to kill the mold and prevent it from growing back. Finally, not only will professionals eliminate the mold, but they will also clean the area that the mold was growing in as well. To begin, a professional mold removal company will come to your home and remove the mold. Next, they will repair and clean the area. Most of all, the job of a mold removal company is to make it seem like mold was never in the area to begin with. Restoration USA is a fully certified disaster restoration company located in Pompano Beach that specializes in water damage, fire damage, mold removal and leak detection, servicing all of Broward county. Most of the services provided will be covered by standard home owners insurance, reducing your worries and the money you have to spend . Call Restoration USA toll free, anytime, at 8667456428 to schedule a FREE evaluation of your home.